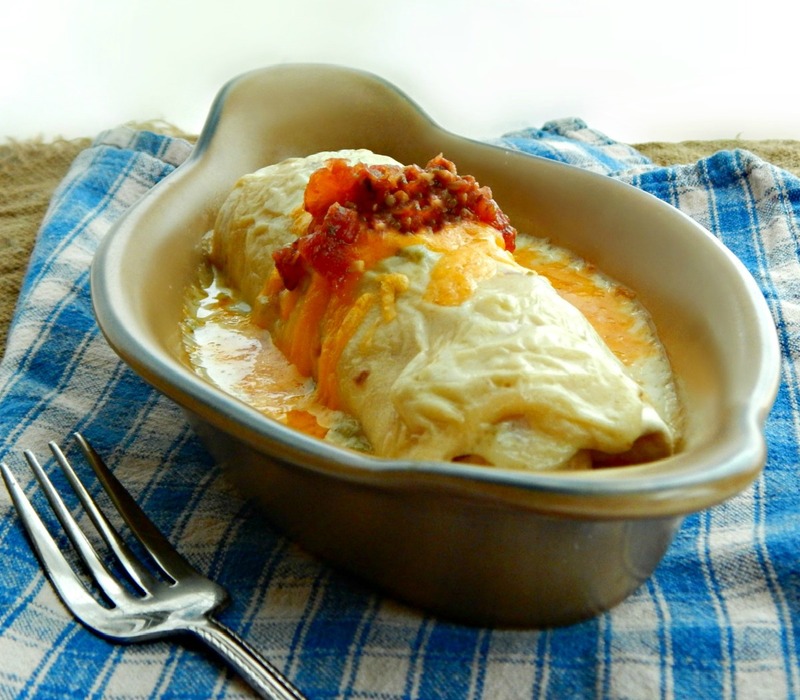 Enchiladas con Pollo is perfect comfort food family fare; I remember my daughter, especially, loved this dish. The filling is rather plain, but the green chili sour cream sauce (and the cheese) takes it to another level. The Enchiladas con Pollo aren’t hot at all, but that sauce does have a little personality. It’s rather doubtful in my mind that these have anything to do with Mexican cuisine, but that doesn’t mean they aren’t downright delicious. I have played around with the filling and sauce over the years, but that’s probably another post altogether. I sometimes use my Chicken Tinga (very well-drained) as a filling and sometimes I use the filling for my Turkey or Chicken Enchiladas. Of course, I usually just throw this all in a 13 x 9″ casserole, but I had to get just a little fancy for my blog and do a few in individual casseroles. The enchiladas freeze well without the sauce & if you have a smaller family that might be an option for you, but the leftovers are great. Chicken regularly goes on sale, so make it a habit to know the lowest price and what’s a good buy in your area. Break it down into packages and freeze. Stock up on all kinds of Mexican food products in the weeks before Cinco de Mayo when they hit rock bottom. I generally buy scads of green chiles and replenish my hot sauces and salsas. Preheat oven to 425 degrees F and spray or grease a 13 x 9″ casserole. In a medium-sized saucepan over medium-high heat, melt butter. Add flour, stir until smooth and cook for a minute. Gradually whisk in chicken broth and water. Cook over medium heat, stirring until thickened. Dip a spoon in the mixture and run your finger over the back; the line should hold a distinct shape. Remove from heat and let cool slightly, two to three minutes, then whisk in the sour cream and green chiles. Pour about a third of the sauce in the bottom of the pan. Combine the chicken, 8 ounces (2 cups) of the shredded cheese and 1/2 cup sliced green onion. Soften the tortillas in the microwave for about 10 seconds. Place about a half cup of the chicken mixture on each tortilla and roll, tucking in the sides as you go. Place seam side down in the casserole. Pour remaining sauce over the top. Bake, uncovered, for 20 minutes. Sprinkle with the remaining cup or two cups cheese and remaining green onions, if using, and bake an additional five minutes until the cheese is melted. Note: this sauce is very good over any number of items, especially Chimichangas. This entry was posted in Click here for Bargain Meals, Click here for Fabulous Food Posts and tagged Bargain Meal of the Week, Cheese, Chicken, Chicken Breast, Easy Recipe, enchiladas, Family Recipe, Green Onion, leftover Chicken, leftover turkey, Mexican or Southwestern, Monterey Jack, tortillas, women of great taste. Bookmark the permalink. I made these last night and they are delicious! I used ground turkey for the filling and flavored it with cumin and garlic powder. Other than that I followed the recipe and talk about yummy. It was easy and will be a family favorite for sure. What a great idea to use your chicken tinga for these. When I made your recipe for that, it made a lot (that froze beautifully). Have you ever made chicken with salsa Verde in slow cooker? So good! That would also be good in this, and I usually also have some in freezer. I think my husband will love this recipe. How do I always land on your site when I’m starving? This looks so gooood. Perfect timing, these look fantastic! Yum Mollie – comfort food at its best…. I’m with you Mollie– wishing I had enchilada leftovers in my fridge right now for lunch! And aren’t those Junior League type cookbooks the best?! My Ani has one from a Junior League in Seattle and I’ve copied a few recipes from it when I’m at her house… These do look so warm and comforting– perfect! hugs friend! My mouth is watering! I need this NOW!! 😀 This looks irresistibly delish, Mollie! Thanks Jhuls! Your comments always make my day!!! 😍😍😍 I love that little earthenware casserole dish you used! Also, your Enchilada looks so cute and snug in there! Hey, ltns! I’ll be stopping over! Thanks, I found them at a second hand store and I HAD to have them. They were just so “retro” or maybe vintage would sound bettr! I think my Mom had some like this when we were growing up in the 60’s/70’s! Goodness, this looks and sounds delicious!